If you are missing one or more teeth due to injury, disease or tooth decay, then you may be an ideal candidate for dental implants. A dental implant is a small titanium screw which serves as a replacement for the root portion of a missing natural tooth. Dental implants are normally placed in either the upper or lower jaws. As a result of the biocompatible nature of titanium, a dental implant has the ability to fuse with the bone and become a solid anchor for the replacement tooth. Moreover, dental implants can be used to treat one or more missing teeth. If you want to know whether dental implants are the right option for your condition, then talk to Dr. Burgess. Dental implants offer various benefits in contrast to dentures or dental bridges. First, dental implants can benefit you with an improved appearance. For example, when you lose an entire tooth, crown and root, shrinkage of the jawbone can bring an old look to your face. Unlike dentures or dental bridges, dental implants will put a stop to this. Second, dental implants can preserve natural teeth by eliminating the need to modify natural teeth unlike with dental bridges. Finally, dental implants will give you a permanent solution since they are stable, comfortable and last forever. At the Burgess center, we use state-of-the-art guided surgical techniques that allow you to have your implant inserted in just one visit. Keyhole surgery allows Dr. Burgess to place a dental implant simply and effectively in no time at all. This procedure is easier on both the patient and the Doctor. Healing time and discomfort are significantly reduced as well. 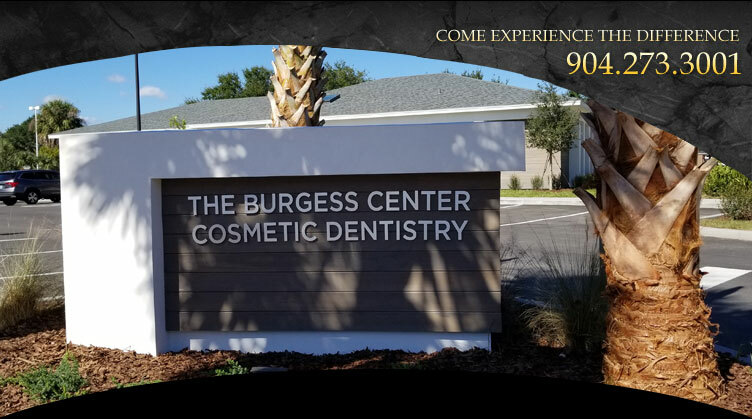 Based in Jacksonville, Dr. Burgess works with an experienced team of oral surgeons and periodontists to surgically place the implants, then a temporary tooth is placed and allowed to heal and bond to the jaw bone. The traditional implant can take from three to six months. The dentist will place the temporary prosthesis and allow it to heal and bond with the jawbone. Then, three to six months later, Dr. Burgess will insert your permanent crown that will give you back your beautiful smile. Health is the main factor when deciding on a dental implant. Age should not be a concern when deciding how to replace the missing tooth. Dr. Burgess can help you decide if you are a good candidate for dental implants. He will evaluate your health history and help you to determine the best way to proceed with your implant. Each procedure is different, and is determined based on the patients dental health, how many teeth need to be replaced, as well as their placement. The Doctor will help you to determine the best treatment method and show you how to care for your new implants to keep a healthy beautiful smile!